The Pitch Perfect - How Do Investors Evaluate a Pitch? 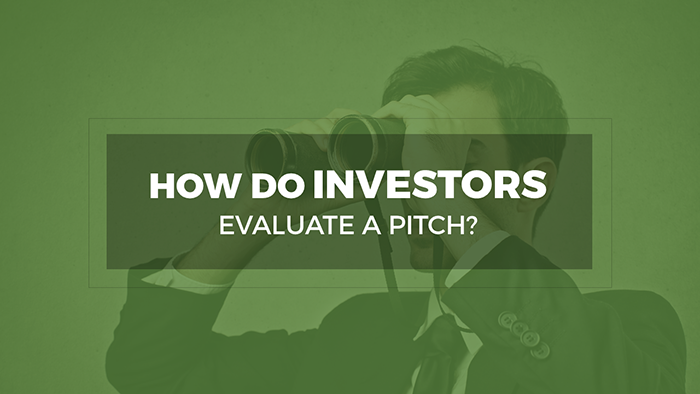 Home>Uncategorized>How Do Investors Evaluate a Pitch? If you have an idea and lack the capital to convert it to business, you will need investors to invest in your business. But why would someone invest in a business that is not his or her own? The answer is simple- a successful startup’s return potential is significantly higher than other asset classes. But the challenge is to know whether the business will be a successful one. 1. How Real Is the Problem? The problem needs to be sold to the investor at first. Creating a startup is not just about building a product. It’s about why it is done in the first place. A real world problem needs to be communicated. Investors justify its gravity when they are shown how the problem is just not yours, but it also affects everyone out there. Then an investor looks into the emotional connection which points out the dire need for a solution. Tip: Pitch the problem, not the solution at first. 2. What’s So Unique about Your Idea? Getting the chance to pitch an idea to investor means the idea is already on the shortlisted portfolio made by investors. On the downfall, investors are presented with a number of pitches every day. How do you ensure your idea does not get filtered? While there may be many solutions to a single problem, an investor looks into why the proposed solution is safe to bet on. People on the receiving end have no formal measures for assessing that elusive creativity. Investors search for an idea that will create huge opportunities, some insight that is durable and defensible. It could be design, better cost or even function. Investors want to believe your company will grow big someday. Your job is to show them the dream. While your idea is a solution to a problem, what matters more is the number of people it reaches to. Hence, venture capitalists evaluate the level of outreach a solution has. To them, size, not the motion, of the wave can save you even when your business faces a downfall. While the problem and the solution are communicated, investors try to find the alignment with their needs, i.e. higher revenues. Investors challenge with augmenting sales profitability. A company’s valuation is determined by the pace at which the company is expected to speed up sales. Investors like high margins irrespective of the sales volume. They search for solid math, a realistic forecast based on state conditions. The product or service will always be imperfect because it’s created by imperfect people Ideas and product can change, but the ability to execute will enforce adaption to changes. A team’s fortitude is tested on the basis of its response to failures and the lessons learnt from them. When faced with adversity, the management team’s open attitude defines how strong they stand together. In short, the investor will look for the story of the management as a team. This gives them the idea of how dedicated and unshakeable they are as a unit. However, to different investors, teamwork can carry different weightage. Say, one might go for 70% management and 30% product. To others, both criterions may have equal importance. When an idea is pitched, judges search for visuals and verbal matches with the implicit models. A prototype is always on the rescue. A detailed potential customer base and target demographic is compared with that of prospective competitor. PR and Advertising campaign when broken down to details set an impression. A venture capitalist aim at slogans that directly conveys the story the business is trying to sell. A financier looks at a business from his own perspective. He evaluates the rewards he will have achieved when he leaves the business. And to make sure he looks back at this with gratification, your idea needs to portray a payoff map in his mind. In a more realistic world, a brief persuasive speech of less than a minute can spark interest in what the idea is about. An elevator speech can kindle the magic and the rest is managed. Investors throw pitches in a sorting hat, their minds which quickly categorize the ideas. It might seem arguably unfair, but sticking to the above criteria will help you know what goes inside the minds of investors.